A Little Wednesday Pick Me Up. Hello everyone and welcome to the Hump Day. Everyone smiles when they see a picture of a cute puppy, no matter how hard hearted you are, no matter how cynical you are, it makes you feel better and that is what life is all about. Feeling better day on day. As you may know I have said before Hump Day for me is okay, I treat it as just another day in the week and use it to my advantage, getting as much done as I can, whether that be a trip to the gym, walking or writing (my three main staples of the day oh, plus cooking food…. 😉 ) but I certainly don’t let it annoy me or look forward to it being over. As the saying’s go “Life is too short” and “We are only here once” (in this version at least) so why do we wish away a day that can hold nothing but good things for us all? It can be used in so many positive ways, perhaps giving us a chance to re-invent ourselves or to make the changes that we may have been thinking about for far too long. We should never waste a day, not any day. I have wasted literally thousands of them. I have felt lazy, sorry for myself, ill, pointless and depressed. I have wasted time whilst I wasted time. I have filled my days thinking about what I can have next or eat next or drink next and none of it made me happy. It just made me more depressed, took me closer to the edge of despair and made me question my life. Now I know there is a saying that to get where we are today, we have to go where we have been and I am sure that without my extensive knowledge of time wasting I wouldn’t be able to sit here today and wax lyrical about the virtues of filling every day with life. Life and activity begets life and activity. Even when I am bored I am doing something. Nowadays I hate to waste ANY time at at all. I NEVER watch TV through the day and to be honest I seldom watch it through the evening as well. I prefer to keep myself active walking the dog, going to the gym, cooking my meals ANYTHING but doing nothing. I suppose what I am trying to say is that if I can turn my life around and no longer be the sedentary lump that I once was, there is absolutely NO reason on earth why anyone else cannot manage it as well. There is no secret to it, simply turn off the TV, put on your shoes and go outside. Don’t go to the store but go for a walk. Try nature, if there is no nature go to a park and enjoy the surroundings. Nature is a brilliant way of feeling better, of passing the time and of re-energising yourself all for FREE because nothing beats the feel of being outdoors and once you get the bug, you will want it all of the time. Perhaps you can maybe try a gym because here you will meet people, you will be active and you will feel better every day that you do this. People who work in Gyms are not unapproachable, they are there to help. They are free advice, they are people who understand your problems and will look for solutions to your issues. They will make you feel as though each day counts and life is better if you give them the chance to do it. Like I say, we should not dislike a day simply because of where it is situated in the week, we should embrace it as another opportunity to better ourselves and improve our lives whether it be physically or mentally because that is all that matters in life improving your own self so that you are a better person tomorrow than you were yesterday. And if you don’t believe me, then just look back through the last nine months of my blog and you may just start to think a bit differently, after all it’s worked for me. Food from Monday wasn’t too bad. I started with a high carbohydrate breakfast as I ate early and knew that it would be a while before I had my lunch so I headed for the low G.I (Glycemic Index) shelf and picked a couple of energy boosting ingredients to help see me through. Okay, for sure it put my carb totals up for the day but I knew that would happen so wasn’t very surprised. Lunch was a healthy option and then it was onto the challenge of making the recipe for the Tasty Tuesday post. This was a healthy curry and I am pleased to say went well and gave good macro’s so it has proven to be a healthy dish after all. As for my exercise yesterday, unfortunately I awoke with a massive dip in energy and a severe lower back pain and a numbness along my Trapezius and Latissimus Dorsi which is most uncomfortable ranging between pins and needles and no sensation at all. Most unusual for me of late but try as I may I could not shake the feeling. This basically ended my plan of a trip to the gym and meant that Archie and I only went for a couple of sedate strolls where he was able to stretch his legs and me attempt to loosen my back up. 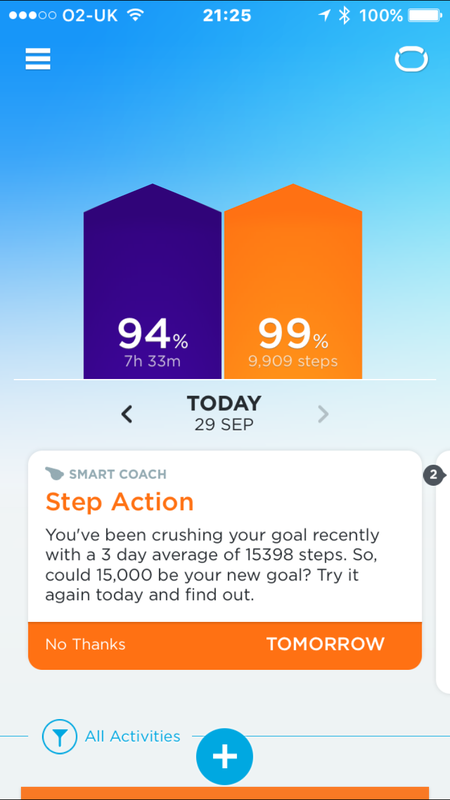 Because of this there are no screenshots of H7 monitors or map my walks and if I am honest the Jawbone Up2 was pretty poor as well so nothing to write home about there either! Still at 9909 steps, I wasn’t that unhappy with the days final numbers after all. Hopefully today will see me relieved of the aches and pains in my back and see my energy levels rising back to what they were last week. If not then I think I will need a trip to get a sports therapy massage because it’s driving me nuts! Still, I can’t complain too much, I am active, I am healthy and I am happy so lets be honest, as I said life is good even when it’s a hump day. I hope your back gets to feeling better soon. It is amazing how much we don’t sit and don’t obsess over what food we want to have next. It shocks me when I’m disappointed a yoga class gets cancelled or when I’m planning a walk outside (yesterday) just to be halted due to rain and storms. I can no longer sit and do nothing and for that I’m grateful. Great post! Glad you like it and YES, it is amazing when we don’t get to do the things we want to do because of external impacts. I am still lacking energy and have just realised that it may be the Flu Jab causing the lack of energy but in a way being counteracted by the B12 shot. I shall speak to the Doctor later and ask the question. Sorry you’re still feeling poorly. Hopefully things will shift and you’ll be right as rain soon! Should be! I think it is a side effect of the Flu Jab and the B12 I had last week. One want to wipe me out and the other wants to pick me up!! I often wonder if I should take B12 shots. I feel fine… But maybe I could feel finer? Ha! I’ve taken the flu shot twice in my life and it really had no effect on me other than feeling drained. I just quit getting them because I never get sick. I suppose it’s because I’ve worked in the schools all of my career. I have been touched by every bodily fluid known to man (and some unknown, I’m sure) so I suppose I’ve built up an immunity. Hopefully I’ll continue to stay healthy! I adore your doggie, by the way… He is precious! The reason the people with a sleeve have the B12 shot is because we no longer have enough stomach to make the enzyme required to produce the vitamin in question. B12 is readily available off of the shelf so it won’t harm to try for sure, but do seek medical advice relevant to your procedure prior to trying it! As I said, I am almost positive it is the babe that has knocked me for six so time will tell. I shall tell Archie he is loved….! I take B12 by mouth each day… I guess if I feel ok… Then I’m “ok.” Or at least that’s my thinking! Of course they are reduced fat!! If you decide to read my book you will see a bloody awful photo of me, fat with long dark hair, which is why my fridge now contains what it does. I honestly look better at 55 (and get more interesting offers…) than I even did so it is never too late to lose weight. I have discovered that avocados help me lose weight but I don’t know why and my skin has never looked better. Eat one everyday with salt and pepper – yum! Thank Kat, glad you like todays post. It was written to say that it is never too late and I am so pleased that you have done something about your situation and are looking to the future. I think Wednesday is my 2nd favorite day of the week with Friday (of course) being my favorite. Good post today. This is exactly what I wanted to tell my family member last weekend when she started whining about being old and now the fattest one in the family. I didn’t say it because I didn’t want to get into the discussion via text, but will if she starts the pity party again. Hope you feel up to speed soon. Thanks Sandi-Lynn, maybe just keep the content of the message in your back pocket for now and let it out if the need arises another time. We are truly the masters of our own desitiny’s so you need only worry about yours and must not let another self pity weigh on your mind. You are strong and able and have proven it to yourself by what you have a achieved so far. I am certain my lethargy is to do with the flu jab so time will tell for sure.